During my senior year of high school at Concord Academy, I completed a senior project where I designed and constructed a tactile screen for blind individuals. The motivation for this project came from the realization that all of my interests in the realms of robotics and engineering are dependent on sight (CAD software, blueprints, sketching). Thus, I wanted to attempt to open up this field to blind individuals by making a screen capable of displaying tactile graphic information. While many single-line refreshable Braille displays exist on the market, no companies have been able to produce a commercially viable, two-dimensional array capable of displaying graphics, due to the large cost of the piezoelectric actuators commonly used. 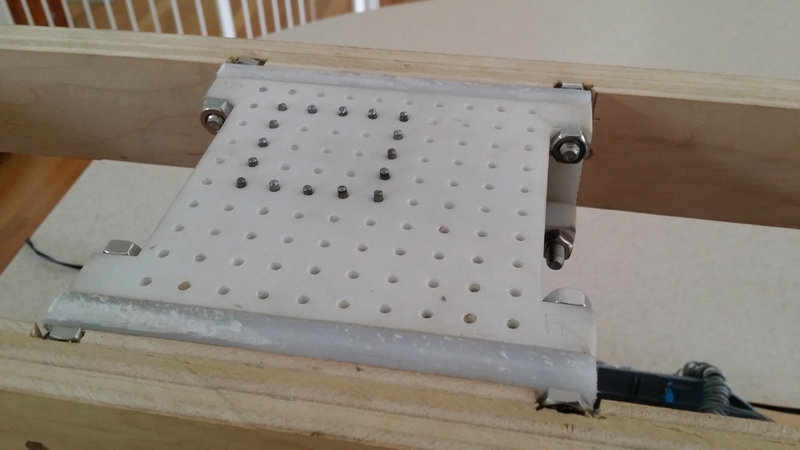 In the prototype I constructed, a 10x10 grid of pixels were actuated by three motors (X, Y, and a toggle actuator that switched the pin state from up to down or vice versa). While this display worked, it was very slow and limited in its resolution. Thus, I eventually would like to construct a larger, faster screen. That said, a new actuation scheme will be necessary to overcome the challenges of size and speed.